By now you know we love having a stash of healthy treats in our freezer or refrigerator. And we love making our own — we use simple, gluten-free and real ingredients, it’s less expensive and they taste amazing. 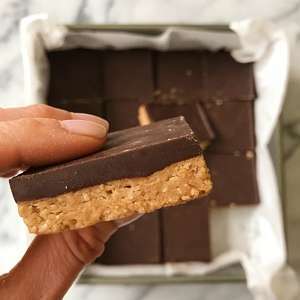 These Chocolate Peanut Butter No Bake Bars are all that! 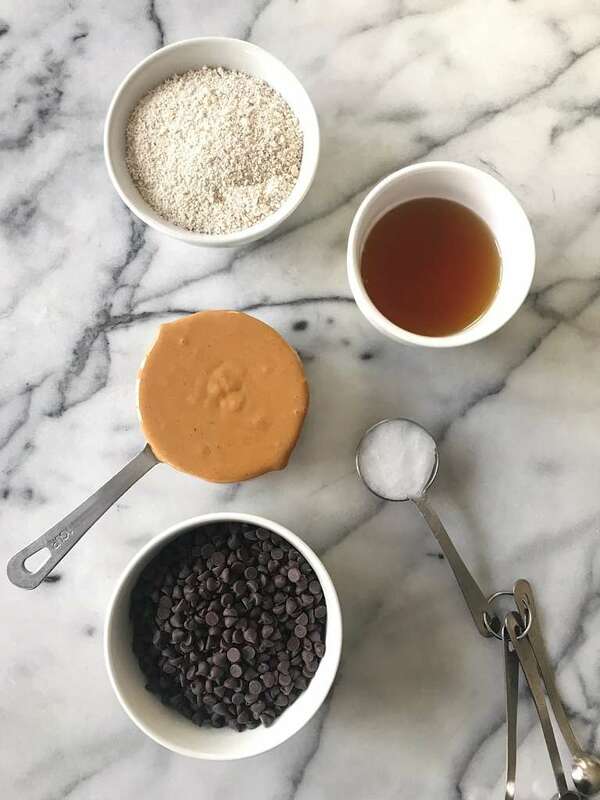 They are made with just 5 ingredients– a base of Peanut Butter (or any nut or seed butter of your choice), Oat flour** (or toss your favorite gluten-free oats into a food processor) and Maple Syrup + a top of melted chocolate chips and a touch of coconut oil. That’s it! ** If you can’t tolerate Oats, we have also made these with Almond flour and they are delish! And they are super easy to make. Heat the peanut butter and maple syrup over low heat. Stir in oat flour (or almond flour) and press into the pan. Top with melted chocolate and refrigerator to set. That’s it! And it takes literally 15 minutes to make the bars, then they set in the refrigerator for 2-3 hours or overnight. And they store well in the fridge or freezer for weeks (if they last that long!). Oh, and did I mention …. they are really YUMMY! So go ahead and make a batch! You’ll be happy you did! **UPDATE: Many of you have asked for a substitute to oat flour. We made it with almond flour in place of oat flour and it worked beautifully if you are looking for an oat-free, grain-free alternative. A healthier treat to satisfy your sweet tooth.. Just 5 ingredients, 15 minutes prep time, gluten-free, vegan and yummy! **UPDATE: many of you have asked for a substitute for oats. 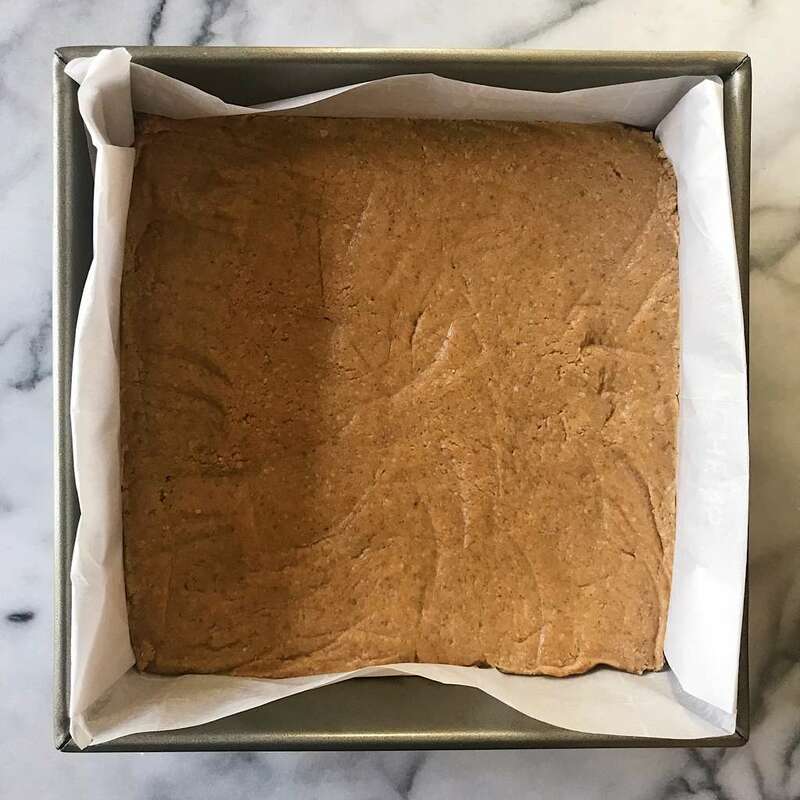 We have made it with almond flour in place of oat flour and it works beautifully if you are looking for an oat-free, grain-free alternative. 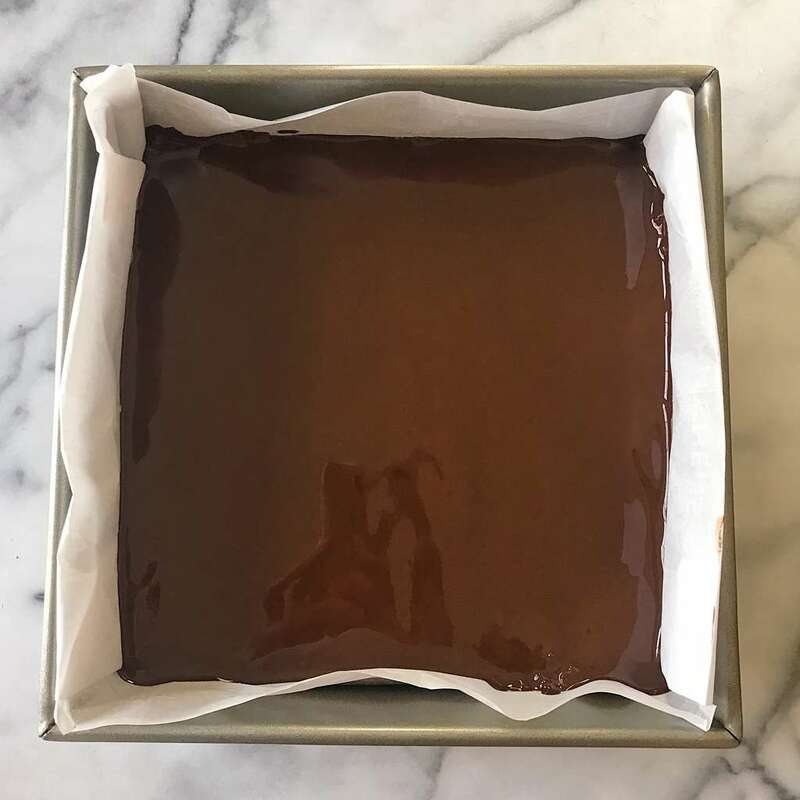 Cover an 8 x 8 inch square pan with parchment paper and set aside. In a small sauce pan, on low heat, mix peanut butter and maple syrup until combined and smooth -- approximately 2 minutes. Remove from heat, add oat flour and stir until well combined. The mix will be thick. Transfer mix to the square pan and press into pan to spread evenly. I like to press the mix down with a spatula to make sure it is even. Wipe the sauce pan clean, then heat chocolate chips and coconut oil on low heat, stirring frequently until melted and well combined. Remove from refrigerator and let bars rest at room temperature for about 10 minutes before cutting. If they are cold, the chocolate may crack a bit when cutting. Store in the refrigerator in an air tight container. Can be frozen. My new favorite treat! These no bake bars are so easy to make and delicious!! Thank you for sharing your wonderful recipes with us all! I love following your blog. Thank you so much! So happy you loved these bars as much as we do! So delicious! Really easy recipe and I had all the ingredients in my pantry already. Thanks so much! Thanks Cassie! So happy you love the bars too! One of the reasons I love this recipe so much is I always have the ingredients on hand! Hi. I’ve never made them with Sunflower Seed Butter but it should work great! Let me know if you try. Simply amazing! We’ve made these delightful bars twice now. They are already a family favorite! Yay! So happy to hear that you all love it so much! Thanks for sharing! Thanks for the recipe, can i substitute the marple syrupe? I’ve IR, thats why i have to use something what is less sweet. Hi Nora. You can substitute honey for the maple syrup… not sure what IR is… can you tell me more? Hi! I don’t have pure maple syrup on hand cans I make with honey instead? Or can you suggest other substitutes? Thanks!! Love your Instagram!! Hi! Yes, honey should work fine!Let me know how you like them. And so happy you love my Instagram– thank you! So glad it worked well with honey and that you love them! Thanks for sharing! This recipe doesn’t have the addition of graham cracker crumbs that your PB Cuos do. Can you share why you made the change? I made the cuos for a friend’s super bowl party, with the substitutof ginger snap crumbs. They were a hit! So happy you love the peanut butter cups! They are a favorite of one of my boys! While these bars have the same peanut butter chocolate flavor, the bars are just a different recipe. The oat or almond flour give it a slightly different flavor and texture. Let me know if you try. Hi Karen, this recipe sounds so good and I’d like to make it for my family but my daughter has a coconut allergy- can I omit from the chocolate topping or any recommendations for a substitute? Love these bars! And so simple to make!! Thanks for sharing the recipe. You’re welcome! So happy you love them too! I find myself making them all time! Aw, love it! Love that your son helped make these and he’s a smart kid — licking the spoon is the best part! I made this for my family this week, Multiple food intolerances and everyone could eat it!! LOVE THESE!!!! I went with the almond butter + almond flour route and used dark chocolate. I also added some popped quinoa + amaranth to the chocolate for an extra crunch. These will become a staple. Thank you!!! I love these bars. So easy and Simple to make.. My favorite s healthy snack. Thank you so much! And so happy you love these bars!